In general, I would rather be overdressed than underdressed. Or as my business partner used to say: “I’d rather overwhelm you than underwhelm you.” But in the case of your image, that isn’t always a good thing. I think that one of the basic tenets of elegance should be to make others feel comfortable around you — to dress for your environment. Don’t get me wrong, I still mean “dress much better”, but not incongruously for your surroundings. Take the rags above. I am in all sorts of stripes and spots. Further examination by Mrs. E. would reveal a pair of natty Thurston braces, too. I tried to lighten up the look for class today by adding a bit of whimsy. Just dandy, sure. But, too much. Although I felt great. Everything was a bit new, a bit … too. The best exemplar of quiet understatement is Beau Brummel who strove for simple perfection in all things sartorial. And in the process changed Regency court dress, and modern menswear forever after. But, to be truly elegant one must be of one’s time. One fact hasn’t changed since Brummel’s day: relatively sober clothing, incredibly well-cut, will do the trick every time. The trick is to cultivate your sense of occasion. What to wear when. But how do you know? At the risk of beating a dead horse, a few rules by which we can all live more elegantly. 1) If the invitation says black tie: wear your tuxedo. With a black bowtie and a cummerbund or a vest, a white soft collar (turn down style), and highly polished black oxford shoes. (Pocket square.) If the event is before six o’clock in the evening, please don’t unless it is insisted upon. Wear a dark suit or a morning suit instead. 2) Wear a suit to an interview. A dark blue or grey suit. No black suits. No funny ties. In fact, wear a dark suit without a funny tie often. 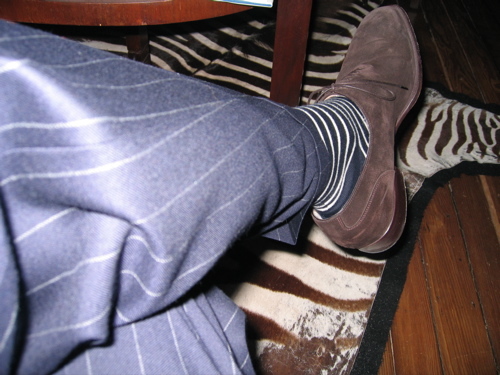 And match your over-the-calf, merino wool socks to your trousers, until you get your feet under you, sartorially speaking. 3) Invest in and wear the most expensive pair of shoes you can afford. Do not go to fashion extremes. You want them to look as good next season. Polish them often. Dark brown and suede are very elegant. Black is never wrong. 4) All clothing, regardless of its formality, needs to be altered. Find a good tailor and patronize him or happen upon a wonderful seamstress and visit often. 5) Refrain from wearing clothing that is too perfect. Too starched is too starched. Sprezaturra is achieved through looking as if you haven’t tried too hard. Whether you have or not is irrelevant. Just make sure it’s spotless. 6) A dark blue, double-breasted suit (or navy 3 piece) with a white french cuff, spread collar shirt, woven tie and highly polished shoes is incredibly elegant. 7) A navy blazer, spread collar shirt with grey flannel trousers and highly polished shoes is incredibly elegant. Double breasted blazers worn with neat ties, more so. 8 )A well-fitted sportcoat (pocket square in place) will dress up any casual clothing from jeans to khakis. 10) In general, fitted top, fuller cut trouser and vice versa. 11) When in doubt, dress better than you have to. I’d like to do one of these for women, but I’m not sure I’m qualified. I know what I like but…. any volunteers to act as tastemaker for my half dozen readers? 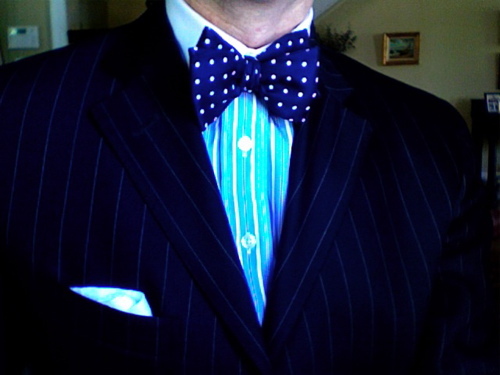 This entry was posted in Cultivating and tagged dressing, Elegantology, pattern mixing, tailored clothing. Bookmark the permalink. that’s a great bow tie. Where did you get it from? Please do a list for women—give it a whirl anyway. A well dressed person who is thoughtful about the art of dressing can impart intelligent advise to either gender. I love such lists and often wondered what a sharp dressed man would suggest for the elegant woman…. (hope it’s not all about dresses and skirts. Egads!) What are your tips for a woman to exhibit sprezaturra? Madame O. Alright. I will rise to the challenge and do my best. Stay tuned and welcome! Thanks for the comment.